Here at Clover Hill (my home in New York’s Hudson Valley, zone 5-b), spring is bustin’ out all over! Would you like to see what I see when I waltz through gardens? Waltz with me, baby. Since you are a guest a Clover Hill, let me offer you something cold and zippy to drink. I hope you can waltz while holding a martini. It’s our drink du jour. Red Jade’s flowers begin their careers as danging, reddish-pink buds. The buds open pink, and gradually fade to white. 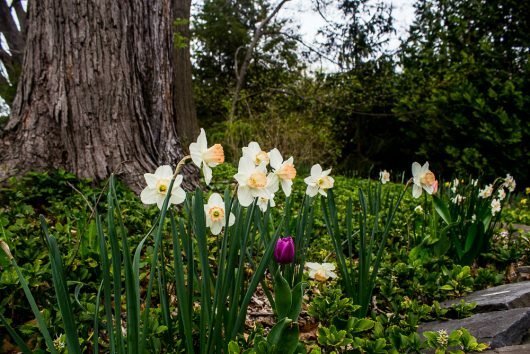 Continuing north on the brick path, we bump into an ancient silver-leaf maple tree, with a charming group of daffodils at its feet. 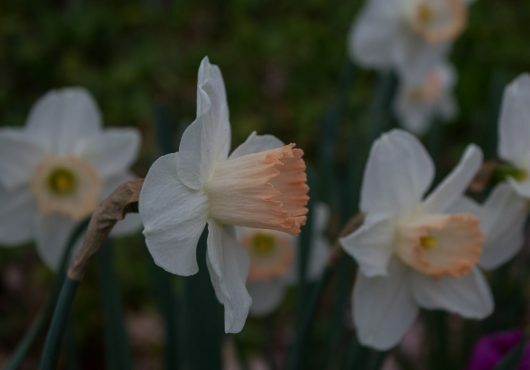 The apricot-cupped daffodils are softly fragrant. Let me hold your martini while you bend down and sniff the perfume. To the right of the maple tree, and blooming in a bed of pachysandra, is the delightful Dicentra spectabilis. 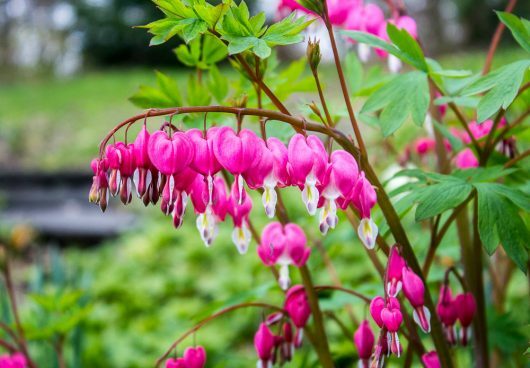 There’s nothing at Tiffany & Co. that could rival these jewel-like “Bleeding Hearts.” I hope you have this pleasant perennial in your own garden. Stunning too is the Forest Pansy Redbud now in bloom on the south hill. 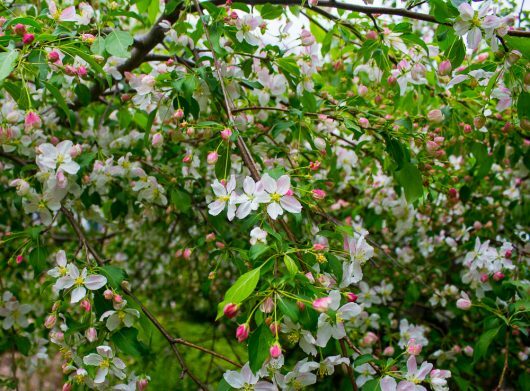 When the blossoms drop, the tree covers itself with heart-shaped leaves. And by the way, the blissful scent in the air is not, as you may have thought, the expensive gin in your cocktail glass. 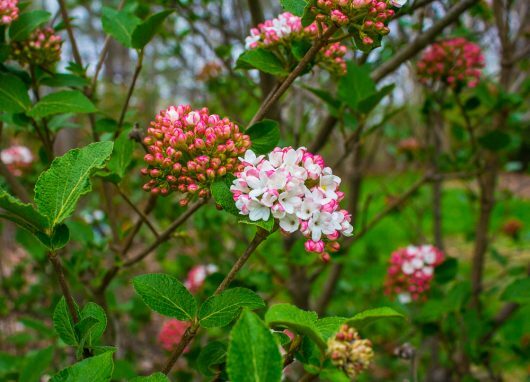 It is, in fact, the mercifully strong perfume of Viburnum ‘Cayuga.’ I have two of these shrubs at the front corners of the kitchen garden. In spring, Cayuga lights itself with reddish-orange pincushions. As the weather warms, the buds mature into fragrant white snowballs. Cayuga is nothing if not generous. It blooms in both spring and autumn! Opposite the kitchen garden is the pool garden. We opened the pool last week. At the moment, the water is too frigid for humans. But it is perfect for polar bears. And here’s the Woodland Garden, the site of a former dump that I filled with all kinds of forest-y plants. Only a few of the plants are ready for closeups. Shall we greet them? And these beautiful, beautiful Virginia bluebells. And this concludes our little garden dance. I hope you enjoyed your time here as much as I enjoyed your company. 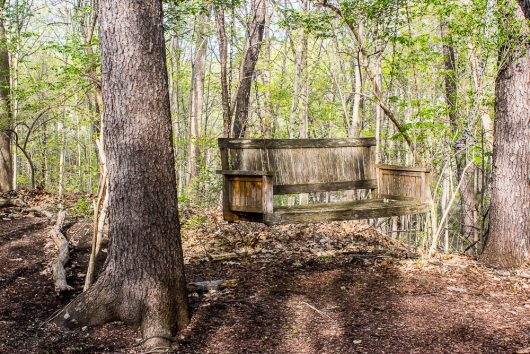 Let’s sit on the slatted swing in the Woodland Garden and polish off our martinis. And then, in the comments field below, you can tell me all about your love life. And if there’s nothing to report in that category, just talk about the plants in your own garden. What’s blooming for you? Rhubarb Streusel Puffs: The Video! All so very beautiful. Spring in our region is so invigorating, time for renewal in so many ways. I could picture some adorable Primroses in your garden. Not fair….I live in northern Maine, and the last of our snow in the back yard melted this past week. We do have some crocus that likes to torture itself by blooming then getting snowed on. So I do appreciate seeing your beautiful gardens and look forward to the next month where our spring comes slowly but surely. Dear Kevin, that was delightful! Makes me draw upon the fondest of memories from my gardens in Michigan. Lilacs and dahlias, grape vines and Shasta daisies; bulb gardens and all the wonder of Spring yielding to Summer. Now I am in South Florida and gardening is very different. Varieties of palms, bromeliads and orchids are the mainstays. Thank you for a charming tour. It was wonderful. I am new to your email group and delighted to make your lovely acquaintance. The Cayuga is a personal favorite too. I have a pair by my chicken coop and they make me smile year round either for their presentation or their promise. In Virginia we are a few weeks ahead of you, but I sure do adore spring. My peonies should burst into bloom this week. Do they survive in your climate? Enjoy. Kevin I always enjoy your virtual tours, please never stop! 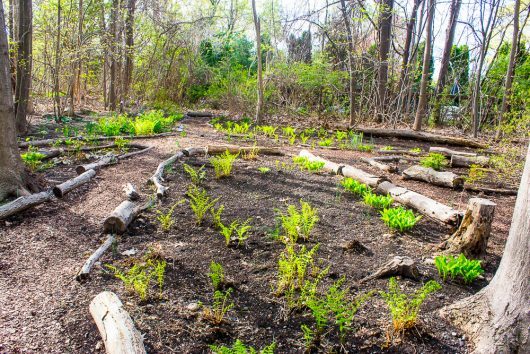 What you’ve done with the woodsy gardens is amazing & I love how you’ve cut out the paths with logs that will one day return to the earth! Loving Life to it’s fullest in Texas fortune cookie style 🙂 (in and out of bed)! 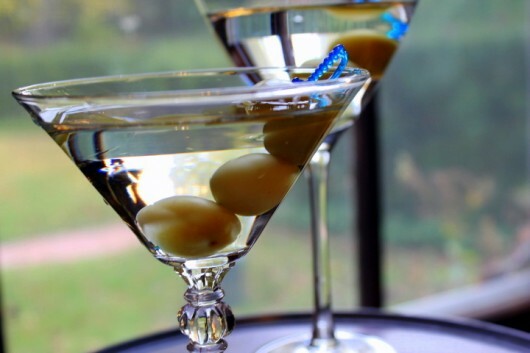 You’ve given me many ideas for my MN garden…love the many flowering shrubs & hope to add some to my small garden…the martini was great! Hello Kevin, I enjoy your posts and recipes and am planning a trip to Hudson this week. Can you recommend a must do/see in Hudson. I’ll be there Thursday through Saturday 5/4-5/6. Always inspiring Kevin…I’m going to go take a walk in our own garden. Yours is fab! You are so delightful, Kevin! Your lovely gardens in your beautiful area (I grew up in NY, so I know the Hudson Valley) are such a treat; thanks so much for sharing them. I enjoy “visiting” with you and am always happy to see something from you in my inbox! Kevin, Very lovely. My garden favorite (well, besides my fantastic peonies!) is my snowflake bush. It blooms some all summer, but it puts forth it’s most beautiful show each Spring. If you’re in VA on a cool spring morning, stop by, we can have coffee and biscotti while sitting in lawn chairs near the snowflake bush! I really enjoy the garden tours! Please keep them up!! Right now in Southeast Texas, the Lantana is going crazy, verbenas are beautiful, roses and gardenias are blooming. Early things like Redbuds, Iris, Jonquils, Flowering Quince are only distant memories. The butterfly weed is growing, but no blooms yet. Maverick Geraniums (winter sown) are in a shaded corner and I am waiting to see if they can withstand our brutal heat. Today and tomorrow, I am going to plant zinnias, cosmos and 4 o’clocks. New plants for me this year are red and yellow Arizona blanket flower, Early Sunrise Coreopsis, and Alaska Shasta Daisy. All started with the winter sowing method. Early Sunrise is growing like weeds and already putting blooms out. I also have many varieties of Coleus, but they are still too small to set out. Thank you again for your excellent tutorials on winter sowing. I use it year around. Our back porch faces south and our climate is so warm, that many times I just set the jugs on the back porch and they still get enough light to germinate quickly. My next projects are going to be hardy phlox and a new verbena. What a wonderful tour of your beautiful gardens! It makes you want to get busy in your own yard! Thank you for sharing! Thank you for the lovely dance in your garden. Here in southwest Michigan my bleeding hearts, both pink and white are nodding their lovely blooms in the breeze. My daffodils are nearly finished, but my lilacs are drawing me in with their lovely fragrance. I have wind flowers dancing along the driveway and the huechera are flushing out. My rhododendrons are blooming their heads off and my purple sand cherry is bursting with soft pink and white blooms. My peonies are growing like weeds and will be blooming soon. I so love spring! Life in our north woods presented snow showers twice in the last few days. There may still be small samples of what were once large snowpiles in parking lots. The grass has turned shades of green and there are sporadic tree buds. My chives are a few inches high…..there is hope for a seasonal transformation of beauty. Thanks for sharing your green, lovely garden KLJ. Awwwwwwwesome ,I am jealous, this was so beautiful, thanks for sharing. Your garden is so very lovely. You possess that rare special insight (design sense) to know what to plant where and where to place focal points such that your garden appears natural and breathe-taking. Wish I could smell your Viburnum. Sadly, no love life, and I don’t see one for the future. Zone 8 -My plants are coming along in my very young garden. This year, I’ve planted ornamental grasses, verbena, salvias, veronicas, and have at least 50 baby perennials grown from seed in pots on my deck. Some yellow cannas are in bloom as well as a larkspur. A mystic sage is still blooming and the day lilies are budding out. Lovely way to preview spring as I pack the car here in FL to head back to New England. 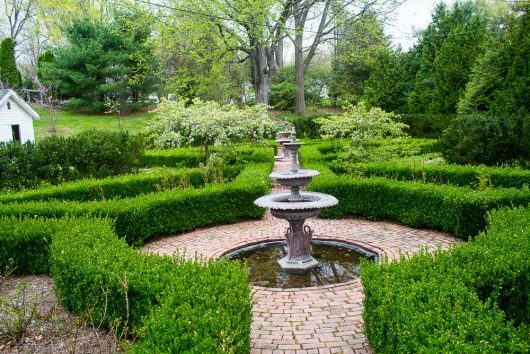 The boxwood garden is dazzling. Made by you from twigs! My gardens are much more modest but you always provide inspiration and fun. Drink was delicious. Can’t wait for the next tour. 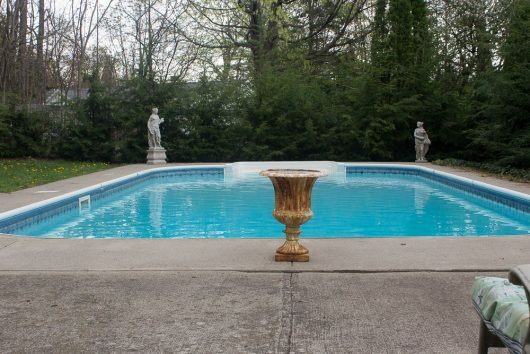 Do you get a fair number of polar bears in that pool? I, too, have been working in gardens. Never sure why the weeds are so prosperous but now they have been vanquished. Wish I had your space. it is so beautiful and relaxing-and a lot of work! What a delightful way to start our morning. It is raining so hard here in Chicago, for the second day in a row, that, although I have many of the same plants as you, I shall only see them through a window today. I just remind myself that rain is good for the garden. Oh, and it is really cold outside. Kevin, thanks for the tour! Very inspiring. Oregon is having a very late Spring but the daffodils are about finished but the tulips are going strong! Lilac is just starting to open along with the snow ball. My favorites are the bleeding hearts and they are magnificent this year. Buds on my Rose’s and fruit starting on the raspberries. Veggie garden is planted with arugula, radishes, peas, lettuce, and chard all popping up! Happy Spring! What a lovely website. Was directed to you through my aunt Carol Westover that lives in Tehachapi, CA. I’m really enjoying the tours and pictures, it takes me away to another world. Would love to plant some beautiful flowers like you have. I only have a few rosebushes right now and a few perennial. Love the recipes as well. I love to cook and bake and I also am a pampered chef consultant. Keep up the inspirational posts please. We are a few weeks behind you in Montpelier, VT. Daffodils are lovely, crocus are finishing. Hyacinths’ scent protected a couple of tulips from marauding deer! Last night it got down to 36, so I put the over-wintered geraniums that had enjoyed last week’s sun back inside for a few more nights. That was GAW-JESS! I’m in zone 3-4, so it will be a few weeks before my garden catches up. Here, on the Canadian prairies, I am just cleaning off the uncut foliage from last years flowerbeds and revealing the 1-2 inches of greenery that is eagerly emerging. Warm weather and rain this week – I better hurry outdoors to complete the takedown before showers. The stroll thru your yard was heart-warming and so pleasantly delightful. thanks! Thank you for beautiful saunter through your garden, I also have a glorious Bleeding Heart, but I chose GoldHeart, I love the golden foliage. The Hosta have popped, but my Mertensia has finished. 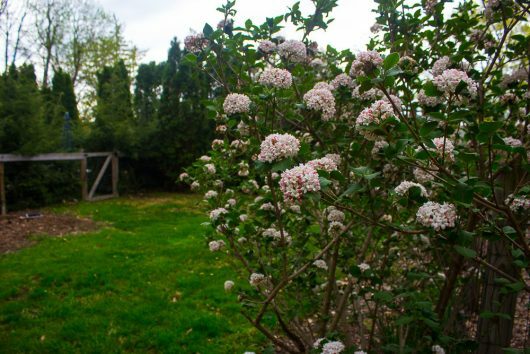 Viburnum carlesii is fragrantly blooming in the corner of my garden but I am sill waiting for the Lilacs and the Calycanthus to add to the fragrance. The violets are finishing, Lily of the Valley has joined the mix and soon there will be Allium and Peonies! Gotta love being a gardener!!! Thank you, Kevin….so beautiful and inspiring! I live in Northern New Mexico where we HAD an early Spring. Sad to say most of the fruit trees bloomed, lilacs blooming 3 weeks early and roses buds showing color….then we were hit with a major snow storm (about 10″) and last night got down to 20 degrees. I guess the next few days will tell us if the wet, heavy snow protected the fruit, etc. I know there will be late flowering lilacs…and the roses will recover. Ah, Spring Time In The Rockies! I am so jealous! After the worst winter in 20 years we now have the wettest spring. Love your garden tours. I winter-sowed a bunch of seeds which are now growing out of the top of the milk jugs. But it is still getting quite cold at night (not to mention the unbelievable mud). What do I do? I always enjoy the time I spend with you. Lovely, lovely, lovely. Kevin, as always the tour inspires me. Spring is such a magical time. I am coveting that Forest Pansy Redbud. Mine is a [now grown up] seedling from a weeping form of the tree at my Brother-in-Law’s house, regular green leaves, and it can’t decide if it wants to weep or grow upright. The blossoms are equally lovely, but if I could add the darker tones of the Forest Pansy leaves, it would be so much better. I once “swapped” plants with a lady two towns away to get a pink bleeding heart, having only the white one before that. I love both colors. Very reliable show each spring. Thanks for the tour! Right now, my Irises, the Rosemary (herb) shrub, and my Red Bud tree are blooming. However, my neighbors have Lilac bushes that are in full bloom. They’re easy to spot when they’re blooming with their graceful clusters of lavender blooms hanging down. It’s a good time of year. A wonderful tour to be sure. Thank you for sharing and giving. My relatively new Mid-Coast Maine Garden is a bit behind yours. My bleeding hearts are just sprouting from the ground and my viburnum has only green buds. That being said, the martini was deliciously dry and the tour of things to come in my own garden was delightfull and reassuring that , Spring is truly here. Hello from England Kevin,i am new to your posts but have really enjoyed your garden tour. 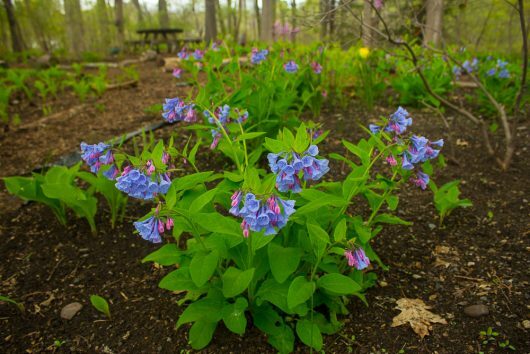 I particularly loved the Virginia bluebells,so beautiful.We have English bluebells out here too at the moment and wallflowers with their lovely aroma.Spring is indeed a lovely time of the year. I’m looking forward to reading your recipes next and your future posts. Thank you for the tour, Kevin. your garden is delightful. I loved seeing your bleeding hearts in bloom. Ours have taken over the rock gardens and part of the back yard and we don’t mind a bit. The white seem not as hardy as the old fashioned pink, but all are welcome wherever they choose to seed themselves. When we moved here, there were cinnamon ferns growing wild, so I moved them to the rocks gardens we built and they are happy there. Wish we had a place for a swing like yours. But then I’d be in it all the time, so maybe it’s a good thing we don’t! My daffodils have long ago bloomed and faded for this season. Some of the tulips also have bloomed and faded; but there are still a few that are blooming. Both of my azeleas are blooming a beautiful red. I also had a tree peonie that had beautiful red blooms; but recent wind and rain have taken their toll on that flower. I have one remaining bloom. Hostas are growing well; but not in bloom. Roses are green; but it will be about a month before they bloom. Irises are getting ready to bloom. Hyacinths and crocuses both bloomed much earlier. My virginia blue bells that I thought I had lost last year have bloomed. This made me so happy. So much is going on and I am trying to enjoy each moment; but it seems that time passes so rapidly. Right now we are enjoying a very wet time; but I realize much of this is important not only for my flowers but also for the vegetables I have planted. I planted a great many cannas this spring; but they have not sprung up as of yet. Perhaps it has been a little cool; but I hope they pop up soon. Last they did so well I should have a forest of cannas this year! Love your post. Hi Kevin- So enjoyed your garden tour! With homes in the Chicago area and in Tucson, AZ, we enjoy very different spring blooms in each garden. It’s amazing how colorful the desert becomes. As I left Chicago yesterday, I realized that we would likely miss the blooming of the new tulip bulbs that we brought back from Amsterdam last summer. We are planning to be in your neighborhood soon. Coming up to see a performance at Penguin Rep. Theatre on May 26th. You are wondering why we would come so far to see a show? We are the proud parents of the playwright! It’s the same weekend as West Point graduation so space is tight -we would welcome your recommendations for where to stay and where to dine. Thanks Kevin! Always love your plant tours and new garden adventures and ideas. Not to say the fun! My love life IS overflowing with flowering oaks, newly sprung violets, wee chickweeds with tiny flowers, golden dandelions and chipping sparrows – all out in the “lawn” of my mini-apartment complex! There has been a truly great showing of daffs this year in my community garden – golden King Alfred and a very fragrant white old timer dug up years ago – not in any catalogs anymore. My town has redbuds everywhere – some violet, others redder – and all spectacular. All mixed in with blooming cherries and the first of the crabapples. Can’t beat a slow, drizzley, New England start to Spring! How invigorating your tour! I just came inside from my own back yard, from cleaning up the last of the winter debris. I see some new buds on many plants. The greatest growth so far is on my bleeding hearts and tulips; they are almost 3 inches tall! Yes, I live in central NB, Canada, zone 3.5. However, just returned from a week in the St. Thomas area of Ontario. The magnolias, tulips, daffodils and forsythias were in their blooming glory and the flowering crabs were ready to go there too. Now I can experience it once again back here. While waiting for that to happen, I can enjoy your gardens again (and another martini) if I get impatient. Thank you for sharing. I could be a polar bear for a day and would enjoy taking laps in the pool. Everything is beautiful as always. Have a beautiful spring. Your Spring is lovely ♥ Ours arrived much earlier this year we are now getting the blooms of Iris and Alliums and the mints are going strong. We’ve had 13 inches of rain in the past two days so everything is a bit soggy right now. Thank you for the charming tour, both the photos and the clever captions. I look forward to the arrival of the cookbook! I’m wondering how you keep all the weeds out! I mulch but they still definitely come through…. That was a fun stroll!! Thank you Kevin – You gardens are just beautiful! flowering plants. These plants may have a different name here. Thanks Kevin. I love the Virginia Bluebells. I wonder how they would do here in Zone5 Nebraska? Kevin, you bring us into your home and garden with hospitality and education. Your posts are invariably a bright part of my email perusal. Hi Kevin, My daffodils here in California are long gone but blueberries and strawberries are going to town. This evening, I enjoyed a glass of wine and my dinner outside while pouring over garden books. When will I be adding yours to the pile? My favorite is On Garden Style by Bunny Williams – lots of great ideas. I have lots of ideas, too. Just short, a bit, on the energy to bring them into form! All in good time. absolutely gorgeous. Something to be proud of, that’s for sure. Thank you for the dance, kind sir. Here on the Eastern Shore of Maryland, the dogwoods are in mid-bloom, daffodils and tulips are gone, hostas and heucheras are up and flourishing but not yet blooming. Hydrangeas are leafing out and will hopefully bloom. Last year nary a one bloomed in this area due to a late frost. Wiegela, lilac and azalea are in full flower, yay. And, my favorite iris have gone mad with blossoms. The martini was delicious, but the dance in the garden was delightful. Love the recipe and I will be trying it soon. Here in Minnesota, Zone 4…we got such an early start with higher temps and beautiful sunny days. Now we have stalled with 30s at night, and rain/snow mixes. But redbuds are blooming, magnolias, crabs and bulbs all either starting or have started. Perennials are UP and taking off. Your gardens look wonderful! Greetings, Kevin! Loved your garden tour. Thank you. I just couldn’t get a proper taste of the gin martini though!!! I do have lovely Dicentra blooming in my woodland garden. It is the first year of glorious bloom for all of them. I am so proud. Here in SW Oregon after enduring months and months of continuous rain (not exaggerating!) it is so wonderful to experience the blossoms of spring. 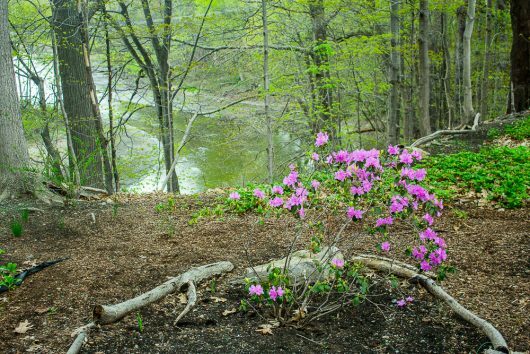 Hostas are popping up everywhere, peonies are burgeoning, lilac is poised, tulips are stunning……I even get to experience my first blossoms of rhododendron! Faithful and beautiful Lenten Rose has been in full bloom since late February, despite the continuous downpours. I visit them often bc they are so wonderfully beautiful and long lasting. The daphne is starting to fade. A longing for viburnum in my landscape has been sealed. I will seek out the Cayuga variety. What beautiful gardens Kevin! I love the seamless transition from formal areas to woodland and river. How do you decide where to spend your time? Inside your gorgeous home or outdoors in in these inviting spaces? I wish I was your neighbor. Let me know when the pool warms up! I have been receiving your e-mails for several years now, but this is the first time I have commented. I tried your recipe for Chicken with Tarragon Cream however I used chicken thighs instead of breast. It was excellent! A definite keeper. Keep on keeping on…I really enjoy your gardening tips and recipes. I certainly enjoyed visiting you lovely gardens. I wish I could still garden, but as I’ve gotten to the age of not being able to do flowers anymore, I’ve certainly enjoy all of yours. I do have azaleas, daylilies, gingers, pecan trees, and a bunch more, but I can’t remember their names. Happy Spring Kevin! Things are budding here too in zone 5. My old apple tree is beautiful and smells like spicy sweet cinnamon. Why I do have bleeding hearts. In fact I have two bushes and they are some of my favorites. Also lots of pretty wild violets are up. I look forward to those all winter. Oh and of course I have a ton of dandelions. Most people try and get rid of those but we leave them. Why some people would ask. They are some of the first flowers up and they provide much needed food for the bees waking up. Any thing that helps the bees gets to stay. Besides my chickens love them and I have the bright yellow yolks to prove it! When are you going to start putting the garden in and do you think Gertie the garden snake will show back up? Your virtual tour was a breath of springtime here in Western Massachusetts. My quince shrub is in blossom as is the bleeding heart. I agree, Tiffany & Co. can’t match the beauty of this bloom. The pieris shrub is in bloom as well. 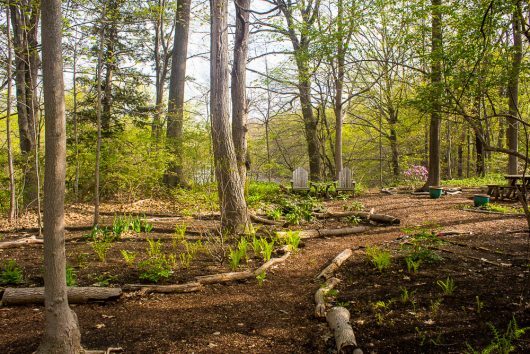 Your forest-y garden is lovely and looks so tranquil. I lift my martini to your gardening prowess. Thank you for the tour. Your abiding joy in your garden is as beautiful as the garden itself. If I lived in zone 5b or much worse 3-4 as writer John, I would have opened a vein long ago. Thankfully I live in 7a and due to southern exposures can fudge it to 8 in some cases. After an exuberant spring, my garden is catching its breath for summer. The last snowbird left April 3rd; the catbird appeared April 14th and his mate the 28th, in time to feast on mahonia berries. The hummingbird feeder is hung and the daylillies are forming buds. I survived another winter! Glad all of you others have as well. Post script: As to my ‘love life’, qu’est que c’est? Un autre temp… mon Dieu. Well, that’s a garden to be tended to as well. Wow!!! Kevin…Love your place..so beautiful…Thanks for all the tours…and all the wonderful recipes. Love them…. I transplanted about 80 things last year and didn’t document it very well so I’ve had some surprises! I’m thrilled that some of the iris that I transplanted last year have buds. The roses look and azaleas look better than last year, when we had late snowstorms which killed a lot of buds. I may even get blooms on the hydrangeas, for which I would be very grateful. Thanks for the tour! Your gardens are beautiful! Here in Maryland, Spring is in full bloom but the weather has turned windy, rainy and chilly. I have little room to garden but I’m going to try to squeeze in Viburnum “Cayuga” it looks amazing! Keep up the good work! I absolutely love the virtual tours and maybe one day, I’ll even visit in person. Hi, I’m so late in responding. I love your garden and have just about all the same plants in mine (Kansas City, MO). I also like the white bleeding hearts and grow those, along with purple columbine. 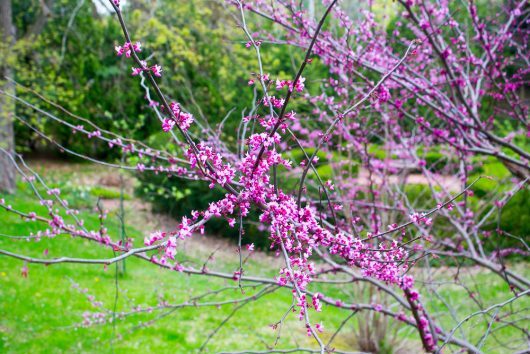 Redbuds are native to Missouri and volunteer themselves joyfully. I love them as they are pest-free, beautiful and delicious. Try eating the flowers, if you haven’t already. They taste like peas (as they are in the subfamily Caesalpinioideae of the pea family Fabaceae). Thanks for the martini! No fair showing 2017 photos! Slooow spring THIS year. I’m a little farther north (Albany) and so far we just have crocus and a few brave daffodils. Your beautiful photos at least show what I can look forward to! Have to check my Forest Pansy Redbud today. PS. Have you ever tried Dicentra eximia? This bleeding heart is smaller, more delicate than its showier cousin, but doesn’t die back, repeat blooms all summer, and does just fine in “full” shade. Would be great in your woodland garden. Did I mention the it seeds in well for more plants (but is easy to control)?